For the first year in many years, I have a new flower still blooming after several snow storms and record low temperatures this fall. I would venture to say the soil where I live in mid-Missouri is finally frozen although I haven’t actually tested it to confirm. After all, the official beginning of winter is only a few days away. In the past, the last flowers to bloom in the USDA Hardiness zone 5b season were, appropriately enough, forget-me-nots. Those delicate blue flowers have established themselves in several growing beds along my walks. As soon as I see them in bloom, I know the growing season is fading. This last growing season had a surprise. Even after the forget-me-nots turned to seed the New England Asters were in bloom. At first I thought it was because one group was in a protected area but when I checked two other congregations, they were all still in bloom. I know they are hardy perennials but surely a good snowstorm, or two, would dampen their blooming enthusiasm. Not so, they are a little worse for wear but still popping out a few flowers. I love their purple color and hardiness so I picked one little sprig to add to red geraniums now in bloom inside. Funny how this tiny little bouquet cheers me when I see it every morning, makes me think about red tulips and my hillsides full of bright yellow, cheery daffodils. Spring is just around the corner, isn’t it?! 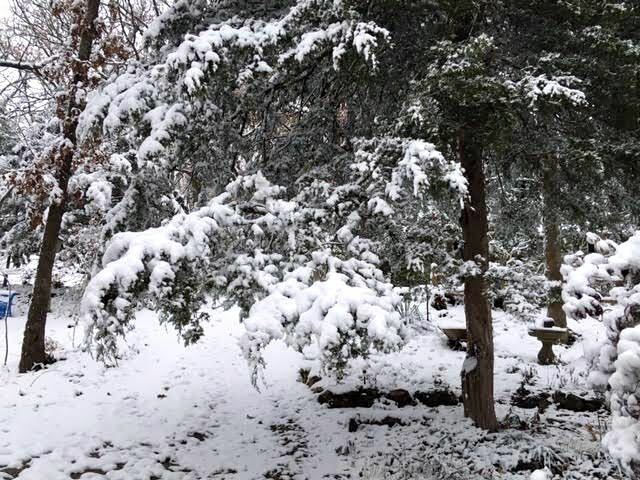 Winter snuck into mid-Missouri earlier than usual fall 2018. Two snow storms, the second dropping 3-4 inches of snow, covered my garden in a lovely fluffy white blanket. These snow storms inspire some of the quilts I carry including snow in the garden. Enjoy this peek at my garden covered in snow, no need to bundle up. 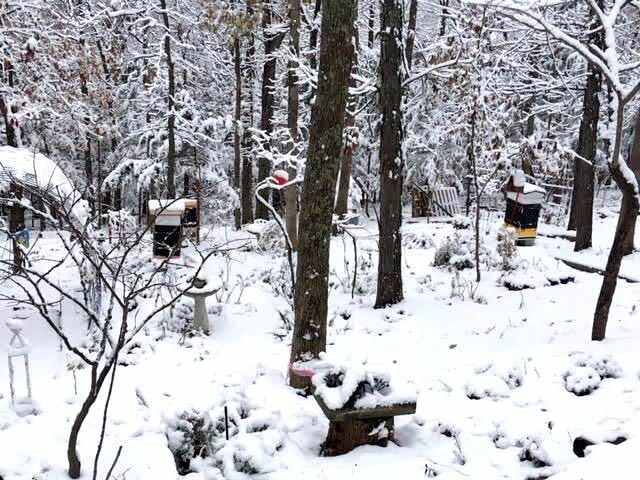 My honeybees have been tucked in for winter. They cluster during cold weather, eating honey for food and coming out to fly when temperatures are over 45F. Stay warm, winter isn’t officially here yet! Interested in helping pollinators, including honeybees? 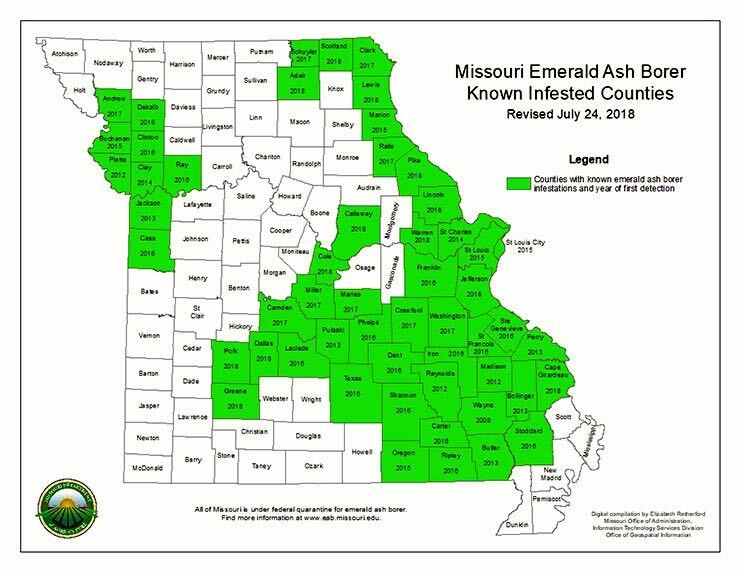 There is a brand new program in Missouri, indeed it is the first such independent program in the country, designed to help the wide range of Missouri pollinators.. Your local bee club can sponsor the program, get programming for half a year and generate revenue for club operations. The Missouri Master Pollinator Steward Program officially launched fall of 2018. The six-session program is designed to teach participants about pollinators, why they are important and what participants can do to help them. Local bee clubs can work with their local University of Missouri Extension offices to request the program in their area; to get class participants registered and to host the sessions, which include hands on activities. The suggested cost of the program is $90 per person. The recommendation is that $25 goes back to the local bee club; another $25 is a required University of Missouri state fee. The remainder $40 is used to cover expenses like printing and supplies, and any surplus kept by that local University of Missouri Extension office. “Details of how funds will be dispersed is part of the discussion a bee club should have with their respective county extension center council,” according to Jim Quinn, University of Missouri Extension specialist and steering committee member. For the past three years, the University of Missouri has sponsored a steering committee to develop the Master Pollinator Steward program. The purpose of the program was to capture those 9 out of 10 people who want to help pollinators but don’t want to keep honeybees, the largest of the pollinator groups. One out of every three bites of food we eat are pollinated by honeybees. Lack of plant diversity and poor nutrition sources is one of the four major challenges to keeping bees alive worldwide. The other two are overuse of pesticides and pathogens carried by a tick-like mite called varroa. More than two dozen viruses have been identified that are vectored by the varroa mite, which deplete bees of their immune system. Bees visit flowers to collect pollen and nectar, which becomes honey. Honey is what bees eat to stay alive through winter. Other steering committee members include Travis Harper and Bob Pierce, MU Extension specialists; Mike Conroy, Sedalia Beekeeping Association; Jim Duever, Boone Regional Beekeeping Association; Bob Lee, Master Naturalist representative; Amber Edwards, Conservationist educator and myself. I helped to author the chapter on honeybees, reviewed some of the other chapters, tracked down photos and came up with hands on activities. For more information, contact Jim Quinn at quinnja@missouri.edu. If you have a riding lawn mower you can have wonderful shredded leaf mulch. Shredded fall leaves, combined with grass clippings, will make rich soil conditioner that will retain water and return nitrogen into the soil that you can’t buy at any garden center. 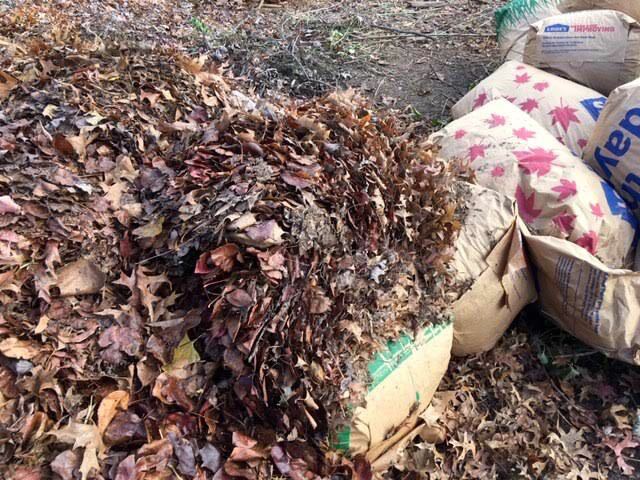 This time of year, people are raking fall leaves and bagging shredded ones, then dumping them at our local composting station so let’s look at some options. Dried leaves can be good garden mulch provided the leaves are fully dry and not still green, or yellow. The leaves that aren’t dry yet need to be dry before applying to a bed but both can be used if this pile is first run over by a riding lawn mower. Here is another leaf pile, this from the inside of one of those paper bags. See the black spots on the leaves? 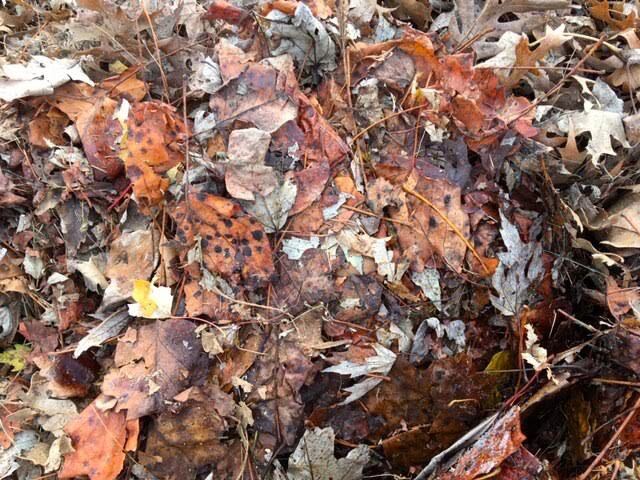 I would be tempted to skip this leaf pile, those black spots are an indication of some kind of spores on the leaves I would rather not spread to my garden. Now we are getting somewhere, this is a leaf pile with both shredded and regular dry leaves. This combination provides good immediate garden cover with the shredded leaves and will continue to work as the new leaves decompose. A combination of dried leaves with grass clippings will also work as long as there are more dry leaves than clippings. Grass clippings will quickly remove nitrogen from the soil and generate heat so try to keep the mix at least even. 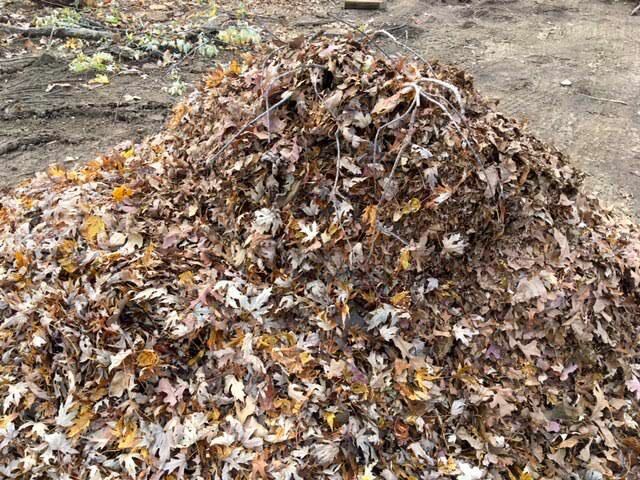 This pile would also make an excellent composter addition, a mixture of both “brown” and “green.”This is the shredded leaf pile I have been bagging and hauling home to add to new garden beds. A combination of shredded dried leaves with maybe a quarter grass clippings. I wear gloves as I pack the bags in case the mulch included poison ivy spores. Even so I still managed to get a long scratch on my right index finger. I have also been raking my dried leaves in my garden and moving them to cover garden beds but this shredded mix is a real treat for my flowers and one that will keep on giving next year. 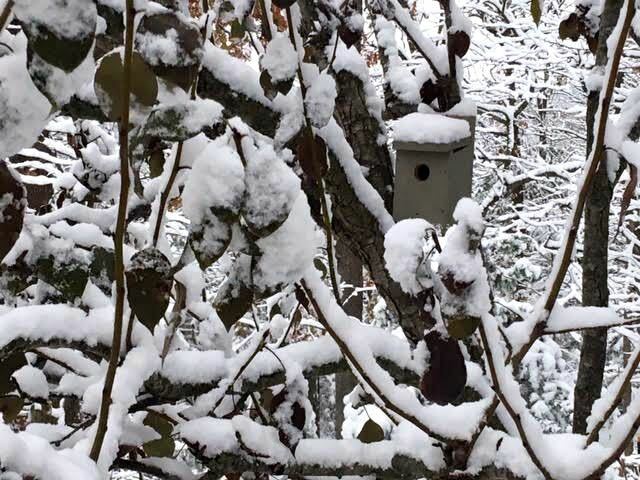 This doesn’t come under the heading of major world developments but it is an inconvenience for the birds visiting my garden feeders after a good rain, snow and ice storm. 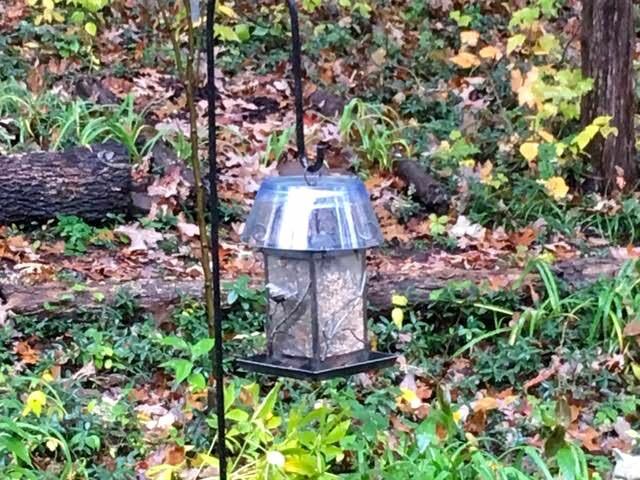 My sturdy metal bird feeders are rectangular in shape and don’t have protective covers to keep the seeds dry. When I checked into the prices for plastic covers, I balked a bit at paying the $59.95 and more per cover. The $60 cover was the least expensive I found. Most of the plastic bird feeder covers were closer to $75 each with some fitting only custom bird feeders. I headed down to one of my favorite local thrift stores, the Community Partnership Resale Shop, and found three potential bird feeder plastic top candidates for $1 each. Two of these bowls started their life as some form of kitchen utensil. The third open wire shape was a hanging basket missing the hanging chains so I thought I could wrap plastic wrap around it if the other two don’t work. If the first two work out, I still have another hanging wire basket so it’s all good. Using a half-inch drill bit to cut holes, the two plastic bowls were then attached to the top and caulked with what was supposed to be a clear caulk for bathrooms and wet surfaces. After waiting a couple of days for the caulk to dry clear, I re-attached the bird feeder hanging rings and took them out for a test in the upcoming rain. The bird feeder tops lift with the plastic bowls attached so I can easily refill them. On closer inspection, the bird seed seems to be staying drier with their plastic umbrellas. Now let’s see how these work over the cold and wet holidays and if the birds get used to their new bird feeder decor. A sure sign of whether these work was during our first snow storm of the season. Birds were sitting in the bird feeders taking refuge and getting a snack so I’m ready to say this worked quite well, don’t you think? I am so enjoying this last rose bud from my garden. This hybrid rose was introduced to the Rose Hall of Fame in the mid-80s and won the All-American Rose award in 1977. That’s a long time ago and something I missed when buying this rose. I picked it up on sale without knowing what kind of rose it was, not a problem for me because I love surprises. One of the better growing conditions for roses is sunny days and cool evenings, which we have been having. I didn’t expect to see any roses blooming until I passed this rose bush and saw this bud falling over. The sides had a splash of pink while the bud looked yellow, similar to the colors in this vintage roses twin quilt. Once in a vase, I had to check for a scent. Wish you could smell this rose, it’s fruity and delicious, just the way one would want a rose scent to be! Don’t know how much red color the rose bud will have at this stage but I don’t care, my nose will happily spend the rest of the season enjoying this wonderful scent! Once open, the Double Delight hybrid tea rose looks like a creamy white rose and lasts about a week as a cut rose. Old gardening books recommend growing raspberries in home gardens because they are delicate to move and hard to keep fresh. I decided to grow them because I love the berries and have had some in my garden in the past. Helping the vines grow in a semi-orderly fashion has not been very - well, pretty. The recommendations are usually to build a flower bed with tall wires or to grow them along a wooden fence. 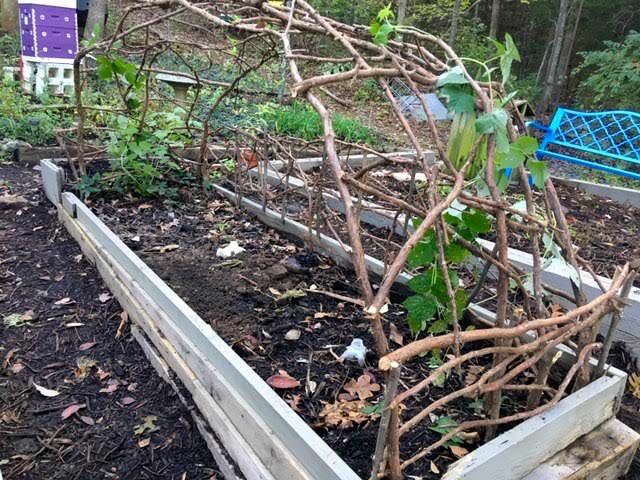 Since I don’t like either, I decided to build a raspberry bed using cut down cedar branches. I was inspired by my friend Tom’s garden. As a gift last year, he gave me an air compressor with a nail gun, a must to easily shape the cedar branches into fences, arbors and gates. Frankly the part that takes the most time is cutting and collecting the branches. 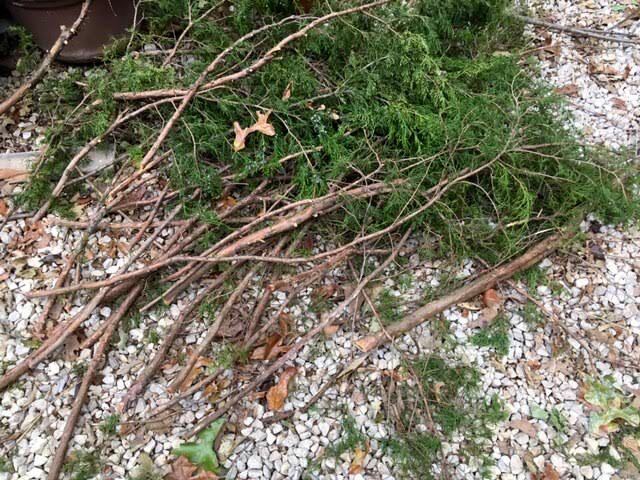 For several weeks, my pile of cut down cedar branches looked like I was getting ready to start a huge bonfire in the middle of my driveway. At first I trimmed some of the branches, then decided to wait until after I had them attached. There is a bit of art and a good dab of carpentry skills to not nail my finger with the nail gun but it is not hard to do. I found the most challenging part was choosing cedar branches that best fit the openings between the vertical supports, similar to one of my Irish Chain quilt patterns. Here is my finished raspberry cedar trellis, now installed in the center of what I have dubbed the “berry patch.” This is one of several beds in the area. Another bed has blueberries. Each piece was made to size and separately, then tied together in the actual berry patch. The large center arch was finished in the berry patch to make sure we had it covered. You can add as few or as many cedar pieces as you want. I left an opening in the top to allow sun through. My raspberry patch has milk jugs sunk into the soil to help keep the soil moist. Established raspberry plants now wind their way around the cedar arbor. I also added a couple new potted raspberry plants that should fill up the bed nicely next year. It may take several years before I have berry-producing canes but I don’t mind, I ook forward to watching this berry patch grow! 1. Not the highest item on my November gardening chores list but one I am looking forward to doing, which is getting my gardening books organized all in one place in my renovated basement library. Even though it’s easy to assume all books are available online, that’s not true, especially the more scholarly horticultural books. 2. Settling potted plants into windows that will give them the light conditions they need. Some potted herbs in particular need good sunlight over winter. 3. Check the last of the garden center plant sales and bury the plants still in their pots into the ground. Make sure to water and mulch so they will successfully pull through winter. 4. Dry leaves make good flowerbed mulch. 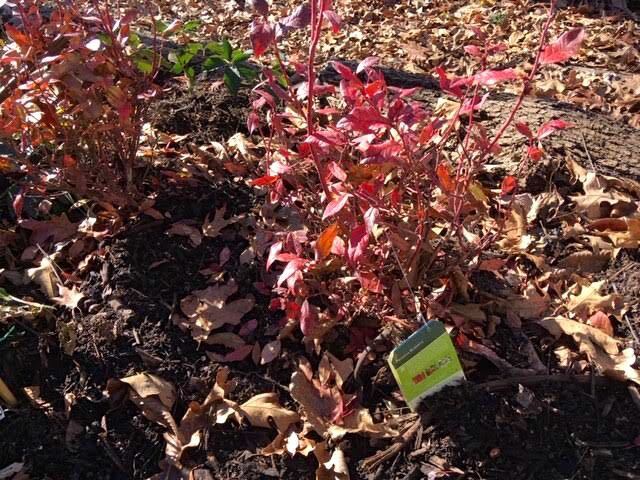 Add a layer of aged mulch on top of leaves to develop a good protective layer. 5. It’s been very dry so remember to water. An inch a week is a good measure, especially for woody plants, such as azaleas and evergreens. When watering, check for damaged branches and remove. Once winter ice moves in, the ice will cause more damage than necessary on those weak and damaged limbs. I take pruners with me so I can also trim out suckers and branches that are too long, especially along where I regularly walk. No point in putting that off until later when the ground is covered in ice and snow. 6. Empty most of your composters on asparagus and strawberry beds. This year I will also feed my new raspberry and blueberry beds. 7. If you have newly-planted roses, mound 6 inches of soil around rose crowns and add a layer of dry leaves covered in mulch for extra insulation. 8. If you haven’t saved seeds for next year, split the difference with your local birds and collect half of your seed supply to dry. The other half will give birds a nice winter treat. 9. You should be on the downside of the mowing season. Make the last cut when you see grass has stopped growing. Let clippings lie where they’ve been cut to restore Nitrogen to the soil. Have fun mowing over the leaves to shred and move them to flower beds. 10. Did you pull a poinsettia through the year from last Christmas? I have two. They are now sitting in a room that doesn’t get evening light hoping the bracts will turn color in time for this holiday. 11. Which reminds me, if you want your Christmas cactus to bloom next month, this is a good time to place it with your poinsettia. Mine started blooming in September because they are temporarily staying in my dining room as we finish the basement work. I’m good with the splashes of color any time of the year. 12. Update your garden diary with what worked well and what you want to try next year. I have found it’s easier to do it now than to try to remember details mid-January. Shortly after moving to Missouri, one of my neighbors tried to explain the rules behind woolly worm forecasting. As I recall, all black means a rough winter ahead; honey brown bands mean mild periods where the bands are on the worm. If the woolly worm has spiky protrusions, watch for ice. If it’s well, “woollier” than normal, better bundle up. If the first wooly worm I found in my garden a couple of weeks ago is any indication, we should have an above normal warm winter. The wooly worm was all brown, a sign that the winter will be milder than usual. I think. Higher and larger ant and termite mounds mean a colder than normal winter. If they’re rushing back and forth in straight lines, rain is coming. When they go in search of food in random patterns, the weather will be good. About this time of year I think about this winter forecasting sign and say to myself I would like to meet the person who sat around watching ants and then comparing their behavior to winter patterns. Then again, maybe not. Bees nests built higher than usual means cold weather ahead. They also cluster around, and in, the hive when stormy weather is approaching. It’s true honeybees cluster – they don’t hibernate – inside a hive when stormy weather is approaching. As a beekeeper, it’s one of the ways I know bad weather is moving in. Bees also move up the hive through winter, eating the honey above them. My bees mid-September were already in their second of their three hive boxes so I moved them down to the first floor. That makes sure they have enough food for winter. Is that a good predictor of weather? Probably not, it’s what bees do when daylight gets shorter. If you need to know the temperature, count the number of chirps in a 14-second time span of cricket chirping. Add 40 to that number and you’ll be within one degree. In fact, many insects tend to be more active when it’s warmer, including the sounds they make. If flies land and bite, rain is imminent. When Katydids begin their chirping chorus, you can expect the first hard frost in 90 days. Seeing more spiders than usual? That supposedly means abnormally cold temperatures ahead. If spider webs are flying in the wind, there will be no rain. If a spider puts up a web, the upcoming weather will be fine. If the spider removes it, a storm is on its way. There is also the Ozark tradition of opening a persimmon and checking the seed. A spoon shape inside indicates above average snowfall, a knife shape signals colder than normal temperatures and a fork shape means warmer than average temperatures. My cats do a pretty good job of simulating this sleeping cat quilt and forecasting the weather for the upcoming day. If they don't get out of bed, I know it's cold outside. It seems they show up all of a sudden, black and yellow garden spiders weaving webs in all sorts of inconvenient places. I like spiders. One isn't charmed by E.B. White's "Charlotte's Web" without having at least a literary affinity to these amazing creatures. Did you know spider web silk is, weight for weight, stronger than steel? Now that I have honeybees, I tend to patrol webs to release bees. I'm not always in time so a number of my bees have become stored food for baby spiders-to-be. If you study any spider web, you will see they are not necessarily picky. Almost anything is fair game to get tangled in their web. Spiders are the insect patrol and clean-up crew in gardens. According to Missouri Department of Conservation, spiders eat more insects than birds and bats combined. Because of this, spiders are a boon on agricultural lands, destroying huge numbers of crop-damaging insects. Since each spider in a field may consume a least one insect per day, their cumulative effect on insect populations is significant. Spiders, along with ticks, mites, harvestmen and scorpions, belong to the class Arachnida. Unlike insects, which have six legs, spiders have eight. They have no antennae, and they have two-piece bodies. A spider has silk-spinning structures called spinnerets at the back end of its abdomen, and it usually has eight eyes of various sizes and shapes. On one of my visits to work in Washington D.C., I stopped by the Smithsonian to see the Orkin bug corner at the Natural History Museum. The exhibits included a very detailed ant farm - more like an ant mansion, behind glass - several exhibits of termites and the kind of damage they can do to wood; a cockroach home and, by far the kids' favorite, the tarantulas. Think furry garden spiders only 10 to 15 times larger and quick-moving, which is part of their gruesome appeal. The day I was visiting, the docent was an older lady who reminded me of my grandmother. She also wore a white lace collar over her dress and those old-fashioned, flower button earrings against her bluish gray hair. All of a sudden I heard her say in her quiet voice "and then the tarantula uses its fangs to s-u-c-k the brains out, just like a milk shake." "EEEEEWWWW" came loudly in unison from kids surrounding her. I'm sure they could be heard all the way down to the first floor by the mastodon elephant replica. Scientists predict that as our climate gets warmer, snakes will grow as long as buses and horses may shrink to the size of cats. Although I find them fascinating, I know way too many people who don’t appreciate spiders in their gardens. We need to rethink how we co-exist with these wondrous creatures. This volunteer cantaloupe grew itself with a little help from an old wooden arbor. I was going to title this how to easily grown cantaloupes but decided I can’t take that credit, either. These cantaloupes grew themselves, my best guess seeds that inadvertently ended up in the compost I added to the garden bed. For years I had head cantaloupes were hard to grow in Missouri. Anything is hard to grow if one is trying to raise plants where the most one grows is rocks and there is little to no soil. After building and amending garden beds, my challenge was to encourage soil production through composting and mulching. There were no plans for much to grow in this particular area this year besides buckwheat as a cover crop. When I saw a few rabbits in the garden area, I took that as a sign the garden bed was getting close to being ready for planting. It can take several months to years for the soil composition to be right for plants. When the first vines started to appear, the leading speculation was these were cucumbers from last year. Since I love cucumbers, I let them grow, adding an old trellis to keep them off the ground. One morning, my handyman took a look at the vine and said if it was a cucumber, it was a mighty round one. A few weeks later the verdict was this was definitely a cantaloupe! To make sure the cantaloupe bottom didn’t rot, I placed a small piece of cardboard under it. Good thing because once picked, there was a black spot on the bottom where the cantaloupe was against the cardboard. Cardboard tucked under the cantaloupe kept it from rotting as it was sitting on the vine. On the other side, a small crack had developed, about an inch long with a star-like pattern. A quick scoop of the knife and the spot was clean. The other end had a 1-inch crack starting, which was easy to remove once fruit was picked. Now to prepare the cantaloupe for easy eating access. I remove the peel, then cut slices into smaller pieces so the cantaloupe can be used as the base for a fruit salad or all by itself. Cut up cantaloupe stored in refrigerator makes for a delicious treat any time of day. You bet I save the seeds, only this time I will store them to deliberately plant them next year! It’s going to seem odd but it is now time to start enjoying garden bounty. With the longest 2018 spring in Missouri recorded history, produce is appearing in my garden. Finally. 1. From cherry tomatoes, onions, a variety of herbs and a volunteer cantaloupe, I don’t have much to gather this year but I will enjoy what I have. Besides harvesting, this is the time to freeze extras for later use. 2. Pick herbs before they have flowered to capture the full flavor. I also wait until after they have flowered and cut the new herb sprouts to dry for later use. Except for basil. A little packrat took all of my basil drying in my garage. I caught and relocated the pack rat and am now waiting for more basil to grow. 3. Start pruning and checking for any hitchhikers on plants that are coming inside for winter. To cut down on leaf drop, bring plants in a month before turning on the heat, which is usually early October. 4. For single plants in separate pots, consider combining them, watering well and the bringing them inside. Even if they only last for a couple of months, they will help to extend the growing season. 5. Water. Perennials, established trees, evergreens and azaleas need one inch of water a week. Water into the ground so the water hydrates plant roots. Keep watering until our first hard frost. For USDA hardiness zone 5d, that is usually around Halloween. 6. Stop fertilizing and pruning. Wait until January-February after the plants are dormant and you can better see their form. 7. If you have trees with fungus or other issues, collect those leaves and burn or bury into the ground. I leave most of my leaves on flower beds except for diseased ones, don’t want to spread that fungus. 8.If you haven’t cleaned up flower beds of spent plants, here’s your last chance to gather seeds. Birds will take the rest after frost. Leave the rest to clean up in spring. By then, most of the greenery will have broken down and become part of the garden mulch. 9. Plant spring bulbs. Add a little bone meal at the bottom of the hole to slowly feed the bulbs. Plant bulbs close together if you don’t mind digging them up in a couple of years to separate. If you would rather not, give them some space in between. Mark where you planted them so you don’t dig them up next year when planting something else. 10. Leave the falling leaves where they are. If you are worried about your grass, run the mower over them. 11. Plant trees and bushes; make sure to water daily until frost. 12. Leaves return Nitrogen to the soil and make a wonderful amendment to flower beds and help retain moisture. 13. Stop long enough to enjoy the beauty of fall as leaves turn, native plants bloom and temperatures turn crisp and cool. A hot cup of tea sounds good about now! One of my favorite sounds to hear in my garden is that of frogs. I love the deep resounding notes of the bullfrogs and the melodious drawn out chirping of spring peepers before they jump back into the water or hide under water lilies as I walk by. As I was going to a yard sale last year, I spotted something I thought my frogs might use, a blue escape shelf normally placed in swimming pools. If a wild animal falls into a pool there is no way for it to swim out safely so these escape shelves are designed to attach to a pool corner for a safe exit. I don’t have a pool but I do have a small pond so I installed the shelf earlier this spring thinking it might come in handy if a turtle or rabbit fell in. For the past 3 months, the escape shelf has been occupied by a young bull frog. All day, actually, from when I go out in the morning to feed the goldfish to before sunset when I wrap up garden work. I walk by him a good few dozen times, dragging all manner of items - shovels, pick axes, boxes of plants, water in buckets, swinging the garden instruments over the pond to clear the small walking path. The frog - I have named him Norman - sits on his new blue lily pad, unflinching. A few times he may reverse direction, or scoot up closer to the edge of the escape shelf but rarely does he jump into the pond. I stopped the other day to say good morning as I was feeding the fish. No response. No movement, his little green back still turned towards me as he sat. One of my cats prefers to watch a mouse game on my cell phone and birds singing on my laptop. I suppose it only makes sense that now a frog would prefer an escape shelf to the traditional lily pad. Missouri bulbs gifted to my brother in bloom settled into their Virginia flower bed. The anticipation was exciting and it had nothing to do with Christmas. My brother in Virginia was doing some garden remodeling and asked if he could send back some of the daffodil bulbs I had gifted him over the years. That way the bulbs could visit "home" for a couple of years and once his new flower beds were ready, the daffodil bulbs could make the trip back to their new garden spot maybe with me in tow. Well, no maybes about it, I will be returning with the bulbs, our family loves nothing more than to spend time together in the garden. Need you even ask was my original answer. Actually I brought a suitcase full back when I visited earlier in fall and already had those settled in. During that gardening time together, we had discussed whether I should set up a special garden beds for the bulbs. After much thought, my brother said no, "I'll just go shopping when I'm ready," meaning he will browse my garden and pick out the daffodil bulbs he wants back when he's ready. I suspect he will also be checking out another favorite perennial, day lilies. He’s never been very interested in tulips, and neither have I. Mice tend to snack on the bulbs and most tulips don’t bloom well the second year except for one tiny patch that has now bloomed for several years in a row at the side of my driveway. I didn't hear much for several weeks. then my sister-in-law broke the news that two boxes were heading my way, and they weighed 70 lbs. How many bulbs in 70 lbs, I would ask. No one seemed to know including my gardening friend Tom. "Oh, you're in trouble now," was his only answer so I decided not to worry about it until the boxes arrived. Two boxes of bulbs from Virginia weighing 70 lbs ready to vacation in my Missouri garden. The boxes were intact and undamaged so I peeked inside the bags. Surprise, there were more than just daffodil bulbs. The daffodil bulbs had decided to start growing. Spring bulbs sprouting need to be planted in the ground so roots can keep bulbs fed. Another bag has iris rhizomes so those will be tucked into a flower bed and heavily mulched until spring. After they get established, they will be moved to their final garden spots next fall. To plant, I will add compost to the bottom of the planting holes along with bone meal so the bulb roots will have access to nutrients. They already have a head start since all bulbs have roots and some green shoots. Although the green tops may be nipped once cold weather moves in, the daffodil bulbs should settle in for winter and continue to store food in the bulbs for use when they bloom in spring. Settling daffodil bulbs in ground mixing soil with compost, then watering after they are covered. The temperatures for the next week are forecast to be in the 60s so good time to get all of these visitors settled into their temporary accommodations. Hopefully by December we will have a hard frost and flower beds can be mulched to keep soil temperatures even. 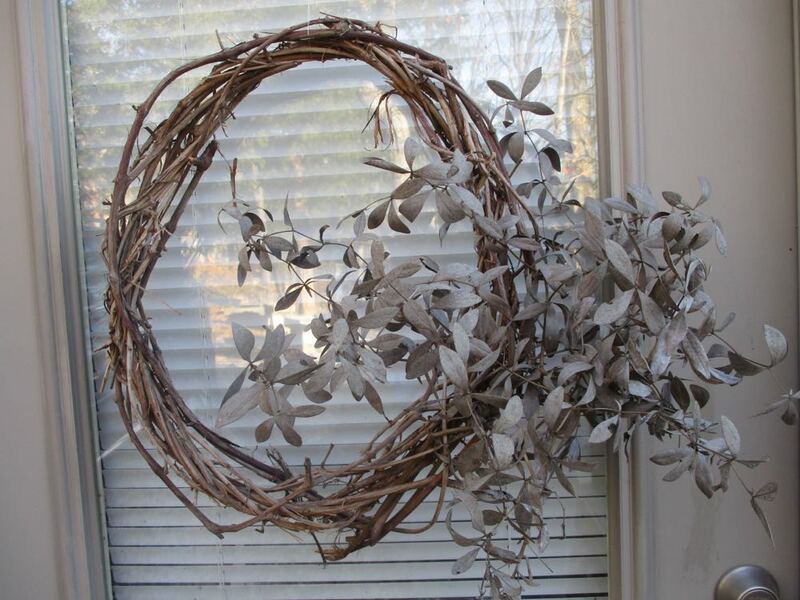 I pile oak and hickory leaves on mine, or let leaves fall where they may. The calendar says it’s the end of the year but it doesn’t seem like it yet, leaves are hanging on trees and I’m still sneaking tiny mum bouquets out of my garden. As soon as a hard frost hits, it will be time to mulch, not before. Mulching maintains the soil at an even temperature. During winter, the point of mulching is to keep plants in hibernation. If you still have leaf piles, move those into flower beds, those will easily make good mulch. I live in USDA's zone 5b, the growing belt of the US. To mulch trees, make a well around the tree trunk and leave an area the width of a tire between the tree trunk and the mulch. When mulching, don’t pile mulch up to the trunk or you will create an area for diseases. Leaving a little moat around the tree also reduces girdling. 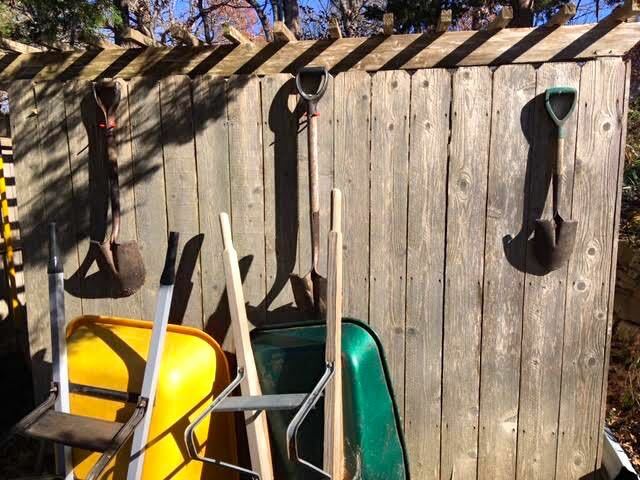 Have empty pots, garden carts, rakes leaning against the side of the house? It’s time to clean them off and store them for the season. The rakes, in particular, you don’t want to step on the tines and hit yourself on the side of the head. Did you plant mums this fall? Remember to water mums every couple of weeks this first year. Once they make it through their first winter, mum roots will become established and won’t require regular watering through winter. Have bulbs ready to bloom through winter? Paper white narcissus, hyacinths and Amaryllis are all good choices to bloom when it’s cold outside. The first two can also be permanently planted outside and Amaryllis are repeat bloomers. I love gardening, even in the middle of winter, don't you? Saving a few of my favorite annual flowers, zinnias, for planting next year. Missouri weather this November has been typically mercurial only more extremely so. Mornings with record lows, then afternoon temperatures are sunny and warm. Or one day it's no warmer than in the mid 20s and the forecast for the next day is in the mid 50s, as it is for this Thanksgiving. 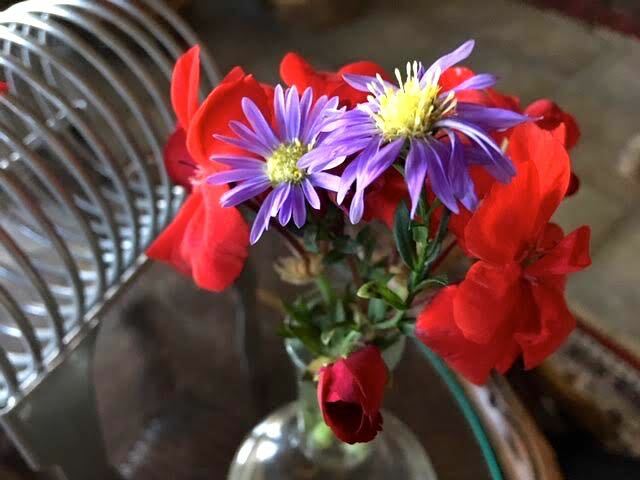 As I was filing up the bird feeders with sunflower seeds this morning, wearing a winter jacket and gloves, I decided not to wait until it was warmer to collect a few seeds of my favorite annuals, zinnias. I planted these late again this year so they didn't bloom until early September but when they did, it was a wonderful addition of color to my fall garden. Of all of the available annuals, zinnias are by far my favorite annuals to plant. They grow quickly in almost any soil, are hardy in most conditions and offer a wide range of bright colored flowers that are favorites of both butterflies and bees. I found one of my zinnia patches tucked away to the side of one of my walking paths, the plants themselves already nipped by cold temperatures. I had my garden tool set with me so it was easy enough to cut off the seed heads to dry out for a couple of days in a paper-towel lined basket before storing in a marked paper bag in a dry cabinet for next year. Do they all sprout again? No, but enough do get a start that it's worth saving a few. Besides, just having the seeds saved reminds me to plant them earlier and to be thankful for everything my garden gives me every year. This large ceramic frog met her match with one of the Missouri's native green frogs. Frogs are among the bell weather species. After years of working with biologists, I know that frogs in ecosystems, or the lack of them, are a sign of the health of that collection of plants and animals that depend on each other for survival. If just the number of frogs in one area is any indication, my little corner of the world is very healthy. I have a lot of frogs living in my one-acre limestone hillside, especially around two small ponds I built to fill in holes that once held driveway concrete. One morning, as I was heading out for a walk, I spotted the showdown between one of my green frogs and the newest addition to "Froggie Bottom," what I call the pond area in memory of one of the metro stops where I used to work in Washington D.C. The ceramic frog had sat at a garden center for years. Finally marked down on sale, I brought it home to keep my other ceramic frog company in the pond area, not giving any thought to how the real frogs would react to the new arrival. As I rounded the corner, it appeared there was a stare off between the ceramic frog and my resident green frog. 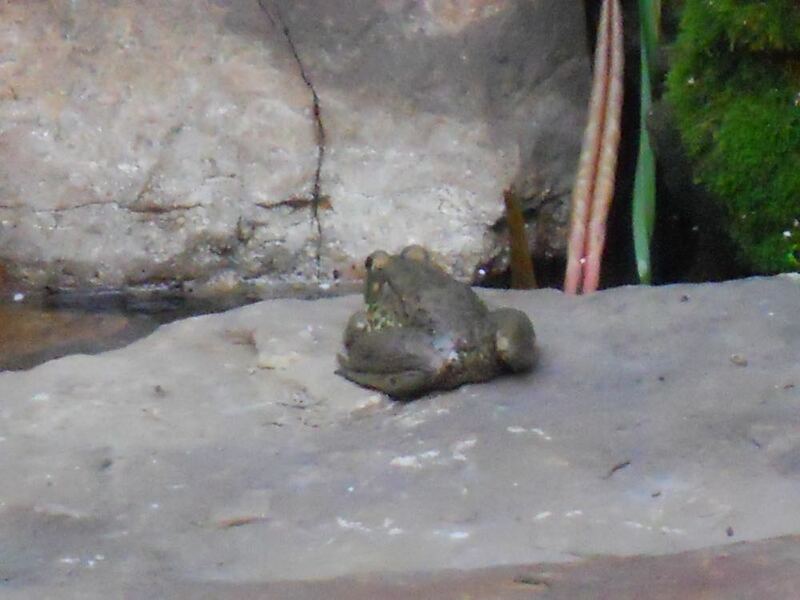 Green frogs, Lithobates clamitans, look similar to a bullfrog but are smaller and have a ridge of skin along the sides of the backs, from behind the eyes to midbodies. Also according to Missouri's Department of Conservation, green frogs may vary from green to greenish tan to brown, with the upper lip and head usually green. There may be faint dark spots on the back, and the legs usually have indistinct dark spots or bars. Adult males have a bright yellow throat. The call is an explosive “bong” that sounds like a loose banjo string. There are two subspecies of green frogs in Missouri. Northern green frog (L. clamitans melanota), described above, and bronze frog (L. clamitans clamatans), a smaller, brownish or bronze frog with yellow lip and head, which is restricted to the southeastern part of the state. See the green frog now? I have dozens of them living in these tiny ponds. Well, the ceramic frog is still holding her ground.